U.S. Law Enforcement Agencies Responsible for Prosecution of Fraud-related Offences in the United States. The National Crime Prevention Council (NCPC) works to prevent crime and build safer, more caring communities. NCPC’s major initiatives include the National Citizens’ Crime Prevention Campaign (NCCPC), an alliance of national, state, and federal organizations that works with businesses, civic groups, individuals, and law enforcement to generate crime prevention awareness and action throughout the country through a variety of mechanisms. The campaign includes a series of public service advertisements, publications, training, technical assistance, and program development. AARP sponsored the first large scale survey of telemarketing fraud victims. The purpose of the survey was to learn more about how this crime affects older Americans. They have launched a campaign against telemarketing fraud that involves research examining older victims and their behavior, partnerships with enforcement and consumer protection agencies, and repeated delivery of a consistent research-based message. That is: "Fraudulent telemarketers are criminals. Don’t fall for a telephone line." The Financial Crimes Task Force has been charged with the investigation and prosecution of criminal offenses involving split-deposit schemes, counterfeit checks, internet fraud, stolen government checks, identity thefts and identity take-overs within Southwestern Pennsylvania, placing an emphasis on organized activity. The task force is committed to aggressively investigating and prosecuting offenders, of these financial crimes, in state and federal courts. FTC Web site ( www.ftc.gov ) A public complaint form was added to the Commission’s home page to provide consumers a direct link to the FTC Consumer Information System. These complaints are reviewed and downloaded into the database, and receive the same quick response as those received by telephone, mail, and e-mail. The Commission receives approximately 95,000 "hits" per day on this home page. In May 1998 alone, FTC.GOV received over 3 million hits from thousands of visitors. ProjectkNOw Fraud is the largest consumer protection effort ever undertaken, an excellent example of coordination among the federal government's consumer protection agencies. The kNOw Fraud partners are AARP, Council of Better Business Bureaus' Foundation,Department of Justice, FBI, Federal Trade Commission, National Association of AttorneysGeneral, the Securities and Exchange Commission and the United States Post al Inspection Service. 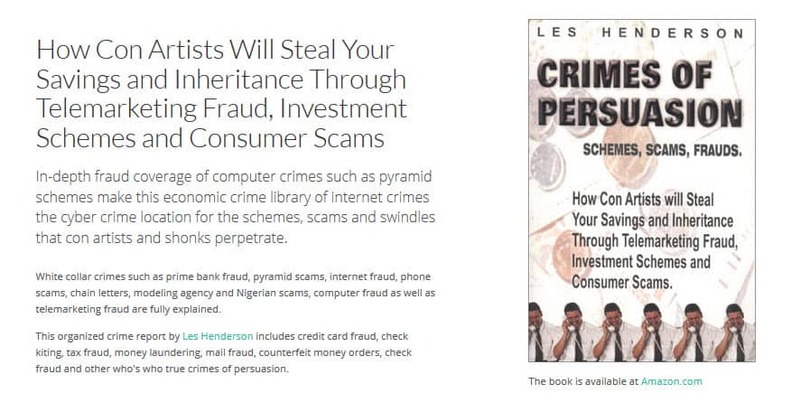 The initiative to date has included a national press conference, more than 100 press conferences in citiesacross the country, and a postcard mailing to 120 million American households alerting consumersto the dangers of telemarketing fraud. kNOw Fraud contacts have reported hearing from more than100,000 consumers. Hoping to duplicate the success of last year's effort, the kNOw Fraud II partnership will focus onidentity theft. The partners plan to take their message to consumers with the help of utilitycompanies, finance and banking institutions, telecommunications companies, Internet serviceproviders and others via billing statements and other customer contact methods. The kNOw Fraud website already provides information for law enforcement personnel on how tohelp victims, including referring them to the toll-free ID theft hotline 1-877-IDTHEFT to file a complaint. All complaints will be entered into the ConsumerSentinel's Identity Theft Data Clearinghouse. You may contact your local law enforcement agency. The Telemarketing Sales Rule gives local law enforcement officers the power to prosecute fraudulent telemarketers who operate across state lines. Note: Appears to have been replaced by Consumer Sentinel. The National White Collar Crime Center, through funding from the Bureau of Justice Assistance (BJA) of the U.S. Department of Justice provides national support for the prevention, investigation, and prosecution of white collar and economic crimes. The Center also has a training and research institute associated with West Virginia University in Morgantown, West Virginia. Center staff include enforcement analysts, intelligence technicians, research analysts, computer crime specialists, and training coordinators. The Center's mission is to maintain a formally structured national support system for State and local law enforcement and regulatory agency members and to facilitate multi-State investigations of white-collar and economic crimes. These crimes include, but are not limited to, investment fraud, telemarketing fraud, boiler room operations, securities fraud, commodities fraud, and advanced- fee loan schemes. The Center operates under the direction of an elected board of directors, and has a membership composed of State and local law enforcement, prosecution, and regulatory agency professionals with criminal investigative authority. The Center operates under BJA funding guidelines and meets the requirements for operating a criminal information pointer database, as established in 28 CFR Part 23. Information sharing:Computerized databases maintained by the Center disseminate case and investigative information on individuals and organizations suspected of involvement in economic crimes. Analytical services are conducted by center staff trained in areas such as financial analysis, check analysis, qualitative compilations, and background information gathering for specific member agency investigations. Case funding: Limited financial assistance is provided to selected multi-jurisdictional member agency investigations. Training and research: The Center operates a national training and research institute that serves as a national resource in combating economic crime by developing partnerships with public and private agencies to address white-collar crime. Some of these training sessions, local and off-site, are open to non-members for a fee. As consultant to the Federal Trade Commission (FTC) Bureau of Consumer Protection, the Center analyzes information on telemarketing frauds stored in the FTC's automated database. The U.S. Department of Justice enforces Federal laws. Federal investigative agencies with major consumer protection responsibilities, such as the Federal Bureau of Investigation, the Federal Trade Commission, the Securities and Exchange Commission, the Postal Inspection Service refer numerous civil and criminal prosecutions to the Department. In pursuing these cases, they seek to protect consumers against dangerous and worthless products and unfair or fraudulent practices. It does so through the enforcement of consumer protection statutes, regulations, and orders. The Department has filed numerous actions in recent years against individuals and businesses committing fraud or violating laws and regulations that are intended to eliminate misrepresentations in the sales of goods and services. The DOJ continues to pursue judicial and enforcement remedies in the area of telemarketing fraud through their International Assistance Group (extradition and legal assistance), the National Strategy Group on Telemarketing Fraud, and the Canada-United States Cross-Border Crime Forum. In the telemarketing fraud area alone, the Department has, in two major undercover operations (Operation Disconnect and Operation Senior Sentinel) brought federal criminal charges against more than 1,300 fraudulent telemarketers. Another component of the Department of Justice, the Office of Foreign Litigation in the Civil Division, plays an important role in certain cross-border fraud litigation. That Office is authorized to file civil proceedings in a foreign jurisdiction where fraudulent activities occur. As a result, it can seek civil remedies in foreign jurisdictions like Canada, including civil injunctions and freezing of individual and corporate assets stemming from a fraudulent scheme that can eventually be paid to the scheme’s victims as restitution. The Federal Bureau of Investigation is the principal investigative arm of the United States Department of Justice. It has the authority and responsibility to investigate specific crimes assigned to it. The Federal Trade Commission's Bureau of Consumer Protection's mandate is to protect consumers against unfair, deceptive, or fraudulent practices. The Bureau enforces a variety of consumer protection laws enacted by Congress, as well as trade regulation rules issued by the Commission. The FTC Act authorizes the Commission to halt deception in several ways, including through civil actions filed by its own attorneys in federal district court. Typically, these court actions seek preliminary and permanent injunctions to halt deceptive activity, as well as redress for injured consumers. Where redress is impracticable, FTC consumer protection actions generally seek disgorgement to the U.S. Treasury of defendants' ill-gotten gains. Its actions include individual company and industry-wide investigations, administrative and federal court litigation, rulemaking proceedings, and consumer and business education. In the typical domestic telemarketing fraud case, the Commission investigates and brings a civil action in federal district court, generally without notifying the telemarketer in advance. The Commission's initial goal is to halt the ongoing fraud by obtaining a temporary restraining order and a preliminary injunction halting the challenged conduct to prevent further injury to consumers during litigation over a permanent remedy. The Commission usually also asks the court to freeze the telemarketer's assets without prior notice to preserve them for consumer redress if the Commission ultimately is successful in the litigation. In many cases, the Commission also asks the court to appoint a receiver to marshall the telemarketer's assets and protect them from dissipation during the pendency of the action. At the end of the case, the court typically enters a permanent injunction against future fraudulent conduct. In particularly egregious cases, some telemarketers have been permanently banned from the telemarketing business, or have been required to post a hefty bond. Most orders require the telemarketer to pay monetary redress to injured consumers or, where circumstances make payment of redress to injured consumers difficult or impossible, to disgorge its ill-gotten gains. Final orders, whether entered following litigation or by consent of the defendants, are enforced through the court's contempt powers. The Securities and Exchange Commission is the government agency that administers the national laws for buying and selling stocks, bonds, and other securities. These laws protect investors by making sure the stock markets operate fairly and that investors have access to all material information about publicly-traded companies and the people who sell stock market investments. The U.S. Postal Inspection Service is one of the oldest federal law enforcement agencies. As the law enforcement arm of the United States Postal Service, the U.S. Postal Inspection Service is tasked with the enforcement of over 200 federal laws covering investigations of crimes that adversely affect or fraudulently use the postal system to defraud the American public. CriminalJusticeDegree.com discusses the field of criminal justice and shows students accredited schools offering criminal justice degrees.